Bringing the Bronx to Broadway! January 2017 – NYC VIBE went up close and personal with a New York City Icon: Tony Bennett. He left his heart in San Francisco, but his soul remains in New York City! Born Anthony Benedetto in Astoria, Queens, this iconic singer of pop standards, big bands, show tunes, and jazz celebrates his 90th birthday with a career retrospective at the Paley Center for Media, exploring Mr. Bennett’s extraordinary life and his impact on American arts and culture. 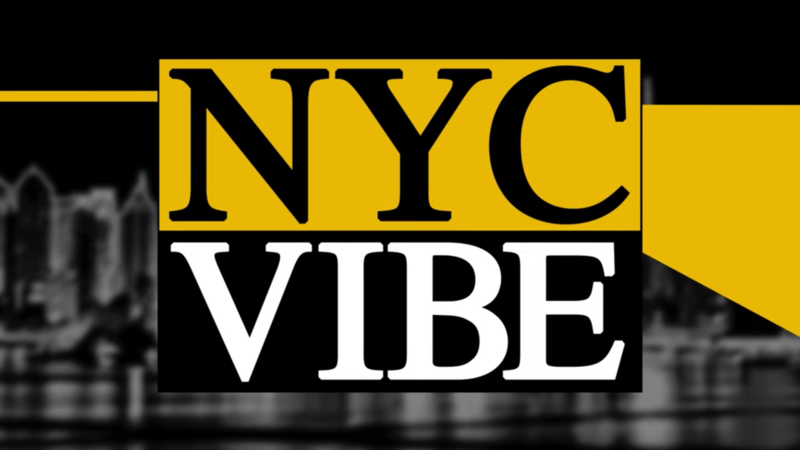 NYC VIBE talks with producer/manager Danny Bennett (Tony’s son), and Mr. Bennett about his Queens roots and family, working the clubs on 52nd “Swing Street” in the 1950’s, his historic Carnegie Hall concert, and his relationships with New York City icons past and present: Frank Sinatra and Lady Gaga. December 2016 – From chic designs to the stylish new concepts – 2016 was an extraordinary year for fashion in New York City! Established names along with fresh new talent displayed their creations on runway shows and catwalks which resonated around the globe! NYC VIBE asked New York City born, raised, and based celebrity stylist Micaela Erlanger to offer her perspective on what a great year it was! Estefan, whose life is portrayed in the Broadway jukebox hit musical On Your Feet! was cited for her inspiration to youth through the power of music and the American Dream. Though Rosie O’Donnell was unable to attend … her kids showed their admiration for Gloria by surrounding her on the red carpet and exchanging hugs and kisses. Ana Villafane, who portrays Gloria in the production, expressed her admiration for the global icon and the thrill of starring in a blockbuster production on the Great White Way. Rosie’s Theater Kids Co-Founder and Director Lori Klinger feels Rosie O’Donnell’s passion and dedication to the kids and to New York City theater. Actor Tony Danza was exuberant in his praise of Rosie and the need to help kids learn about theater and the arts in New York City. Rosie’s Theatre Kids is one of the largest arts-in-education programs serving New York City public school students, and is one of the only organizations that provides all of its core services free of charge. Since its founding in 2003, Rosie’s Theater kids has influenced the lives of over 80,000 NYC school students from grades pre-K through 12th grade, many of whom have never had the opportunity to see a Broadway show or experience the thrill of seeing live art performances. It’s that time of year again when ghosts, goblins, and all kinds of creatures of the night make their way up Sixth Avenue in costumes and floats…..
Every year, the Village Halloween Parade plays an important part in the cultural life of the City. This year, 2016, marks the 43rd running of the annual Village Halloween Parade. It started out as a small Greenwich Village gathering in 1974 – and now the Parade has emerged as the nation’s largest public Halloween celebration. Last year, an estimated 100,000 people marched in the parade alongside puppets, musicians, and dancers – with an astounding two million spectators watching from the sidelines. This year, those numbers have indeed grown …. According to the Village Halloween Parade organizers – this year’s theme is “Reverie” (REV-ER-EY), which represents “that liminal space in which one creates.” The organizers also proclaim: “One thinks of Halloween as a chance to fantasize, but more than anything Halloween lets us realize, allowing us to play ourselves, and leaving the remainder of the year for sleepwalking.” The Village Halloween Parade is supported, in part, by public funds from the New York City Department of Cultural Affairs in Partnership of the City Council. This year’s Parade is also dedicated to the memory of Maggie Peyton who served as a Director of Arts & Culture under four borough presidents. The Village Halloween Parade in New York City has a rich history. The Parade has won an Obie Award and been recognized by the Municipal Arts Society and Citylore for making a major contribution to the life and culture of New York City. In 1993 the Parade was awarded a major NEA Grant for Lifetime Achievement. In 1993 and 1997 the Parade was awarded Tourism Grants from both the Office of the Mayor of the City and the Office of the Manhattan Borough President for it’s economic and cultural benefits to the City. NYC VIBE went behind the scenes with two of the Village Halloween Parade’s most legendary participants as they prepared for the 2016 event. Serra Hirsh is an accomplished puppeteer, voice actor and theater artist. Serra teaches prop building at the LaGuardia High School of the Arts, and leads workshops in movement, voice and acting. Every year in the Village Halloween Parade, Serra constructs a “human float” in which she incorporates herself into a particular “situation” This year, Serra’s costume is entitled INSOMNIA – She portrays a person in bed who cannot sleep and resorts to counting sheep! Welcome to the Halloween world of Barnaby Ruhe! Doctor Ruhe received his degrees in Shamanism and Art Practice – which combines psychology, anthropology, art history, phenomenology and art studio action. Barnaby was the senior editor of ART WORLD newspaper, and runs workshops at the Burning Man festival each summer, among other activities. Every year, Barnaby paints a work of art as he marches in the parade. This year Barnaby will assume the character of MOODANG – the female shaman of Korean Painting Spirits …. October 2016 – New York, NY: May the force be with you! The replica gauntlets, silicone props, Pokeball contact lenses, bright fluorescent wigs, walking scale models, ‘techcessories,” and plastic swords – among other assorted surrealistic regalia – were on full display as comic book character fans from around the world descended upon the Javits K. Javits Convention Center for Comic Con New York 2016. With over 150,000 paying customers, New York Comic Con is the East Coast’s biggest and most exciting popular culture convention. According to fans, one of the most important elements of New York Comic Con is a sense of community. “Cons” as they are commonly referred to, rejoice at the opportunity to express themselves sans the cynicism and judgment that Comic Con events usually elicit from critics, and late night television spoofs. The only requirement to be a member of the Comic Con kinship is passion! Costumed super-fans of all ages interacted with their favorite characters and creators at this annual extravaganza which hosts all things comics, graphic novels, anime, manga, videogames, toys, movies, and television. With celebrity appearances, panels, lectures, meet-and-greets, and other activities, New York Comic Con is the second largest pop culture convention in America and the only one that takes place in the comic book, publishing, media and licensing capital of the world — aka Gotham City! The Javits Convention Center was the first site of Comic Con in 2006. October 2016 – Three-time Academy Award® winner Ang Lee brings his extraordinary vision to Billy Lynn’s Long Halftime Walk, based on the acclaimed, bestselling novel. In his film, which also stars Vin Diesel, Kristen Stewart, Chris Tucker, Garrett Hedlund, and Steve Martin, Lee dramatizes war in a way truly never seen before, using new technology to shoot and project portions at a frame rate of 120 frames per second for the first time in film history. Two-time Academy Award® winner Ang Lee brings his extraordinary vision to Billy Lynn’s Long Halftime Walk, based on the widely-acclaimed, bestselling novel. The film is told from the point of view of 19-year-old private Billy Lynn (newcomer Joe Alwyn) who, along with his fellow soldiers in Bravo Squad, becomes a hero after a harrowing Iraq battle and is brought home temporarily for a victory tour. Through flashbacks, culminating at the spectacular halftime show of the Thanksgiving Day football game, the film reveals what really happened to the squad – contrasting the realities of the war with America’s perceptions. The film also stars Kristen Stewart, Chris Tucker, Garrett Hedlund, with Vin Diesel, and Steve Martin. Lee used new technology, shooting at an ultra-high frame rate for the first time in film history, to create an immersive digital experience helping him dramatize war in a way never seen before. Lee directed and produced the film, from a screenplay by Jean-Christophe Castelli and based on the novel by Ben Fountain. Marc Platt, Rhodri Thomas, and Stephen Cornwell are also producers. October 2016 – New York, NY: Derek Jeter and an “all star” cast of athletes, celebrities, and supporters came together to support the baseball icon’s Turn 2 Foundation in New York City on its historic 20th Anniversary. The former New York Yankees captain and All-Star shortstop hosted the 20th Annual Turn 2 Foundation Dinner at Cipriani Wall Street to raise money for the organization’s youth initiatives. 20 Years of Turn 2: Since its launch in December 1996, the Turn 2 Foundation has created and supported programs and activities that motivate young people to turn away from drugs and alcohol and “Turn 2” healthy lifestyles. Its signature Jeter’s Leaders initiative is a four-year leadership development program that fosters academic achievement, positive behavior and social change among high school students in New York City and West Michigan. The name “Turn 2″ is symbolic of the dramatic double play made by infielders during a game. It also represents Derek’s wish to promote healthy lifestyles among young people and enable them to “Turn 2″ his Foundation for guidance and the much needed help to avoid drugs and alcohol. During its 20-year history, Turn 2 has given back more than $23 million to organizations that support its mission. Celebrating Turn 2: Television personality Hoda Kotb also served as host for the evening. Rhythm and blues singer and recording artist Ne-Yo delivered a special musical performance for Derek and his supporters. Among the celebrities in attendance included current New York Yankees stars Dellin Betances and CC Sabathia; Derek’s role model and former Yankee great Dave Winfield, Derek’s former teammates Tino Martinez, Jorge Posada, and Robinson Cano; former New York Giants Tiki Barber and Harry Carson; local basketball icon and head coach of St. John’s Red Storm Chris Mullin; football stars Nate Burleson and Chris Canty; former WNBA stars Swin Cash and Teresa Witherspoon; former New York Jets wide receiver Wayne Chrebet; Matt Harvey from the crosstown rival New York Mets; Pittsburgh Pirates star Andrew McCutchen; former model and entrepreneur Kathy Ireland, and former football star, author, and radio personality Tim Green, among others. September 2016 – New York City: Empower to the people! Music and activism took center stage on Saturday, September 24, 2016 as individuals spanning generations who earned a free ticket to the concert by raising awareness for Global Citizen’s ongoing initiative to eradicate poverty converged on Central Park’s Great Lawn in New York City. The daylong concert event, which advocates for change and bringing world leaders together to fight against extreme poverty, featured riveting performances by a diverse array of musical artists. With Rihanna, Kendrick Lamar, and Metallica as the Festival’s main headliners, attendees were singing melodies and dancing on the lawn to the vibrant rhythms of Demi Lovato, Major Lazer, Usher, Coldplay’s Chris Martin, Ellie Goulding and Yandel, among others. In addition to the musical performances, speakers including Chelsea Handler, Deborra-Lee and Hugh Jackman, Pete Wentz, Neil Patrick Harris, Forest Whitaker, Priyanka Chopra, Salma Hayek-Pinault, Jada Pinkett Smith, Norway Prime Minister Erna Solberg, and former Tanzanian President Jakaya Kikwete advocated for change. Global Citizen is a social action platform for the global generation who are passionate about learning and taking action on the world’s biggest issues. Global Citizen works in partnership with and supports some of the most effective organizations working to achieve the global goals and end extreme poverty. Committed to providing the most interesting stories, effective actions and powerful campaigns, Global Citizen aims to reach and recruit the largest possible number of people who care about global issues. May 2016 – In midtown Manhattan, soccer icon Pelé met with the media to discuss his highly anticipated biography film Pelé: Birth of a Legend. Pele’s Life Story Comes to the Big Screen in IFC Films Biopic In Theatres and on VOD May 13. The IFC Films movie made its world-premiere at the 2016 Tribeca Film Festival. Pelé, who also served as executive producer, was accompanied by the film’s directors, Michael and Jeff Zimbalist. The film will be in theaters and on Video On Demand on Friday, May 13, 2016. About Pelé: Birth of a Legend: The early life and rise of Brazilian fútbol hero Pelé — the youngest-ever World Cup winner at 17 — is portrayed in the biopic Pelé: Birth of a Legend. Widely regarded as the greatest player of all time, the man born Edson Arantes do Nascimento is still lionized around the world for his contribution to “the beautiful game” of soccer. PELÉ chronicles the early career of the legendary soccer player – from his impoverished childhood in a Brazilian favela to his rise to glory in leading Brazil to win its first ever World Cup in Sweden in 1958 at the record-setting age of 17. Pelé’s unorthodox yet authentic style of play and indomitable spirit inspire a country and change the sport. The cast includes Emmy-nominated Vincent D’Onofrio (MEN IN BLACK, LAW AND ORDER: CRIMINAL INTENT) and famed Brazilian musician Seu Jorge (CITY OF GOD, THE LIFE AQUATIC WITH STEVEN ZISSOU) as well as Mexican rising star Diego Boneta (ROCK OF AGES, SCREAM QUEENS), Golden Globe-nominated Colm Meaney (THE SNAPPER, THE DAMNED UNITED) and Rodrigo Santoro (300, LOVE ACTUALLY). Additional cast includes local talents such as Mariana Nunes, Milton Gonçalves, Rafael Henrique, Marcus Vinicius, Julio Levy, Thelmo Fernandes, Felipe Simas, Charles Myara, Jerome Franz, and Roger Haag.